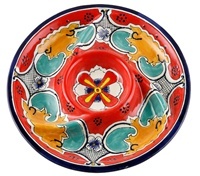 "Tray oval 9.25"" X 12.75"""
This colorful salad plate is lead free and dishwasher safe. 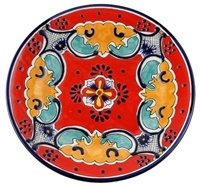 This colorful lunch plate is lead free and dishwasher safe. Great service tray for appertizers. 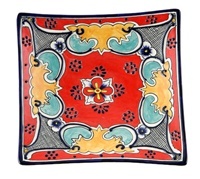 "Tray 6"" X 16"" long"
"Square plate 11"" X 11"""
Great service tray for appertizers. 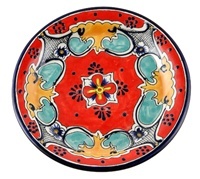 This colorful dinner plate is lead free and dishwasher safe. This square plate is great for salads and appitizers. 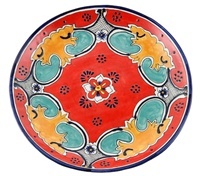 "Tray rectangular 8.75"" X 15.25"""
Great serving dish with brilliant colors. 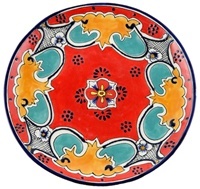 This beautiful, handpainted plate makes a statement on any wall or display cabinet and also is a great serving platter. These plates are all lead-free. Beautiful party platter. Great for chips and dips. "Tray handled 11.75"" X 19.75"""
"Divided tray w/ 6 compartments 12.50"""